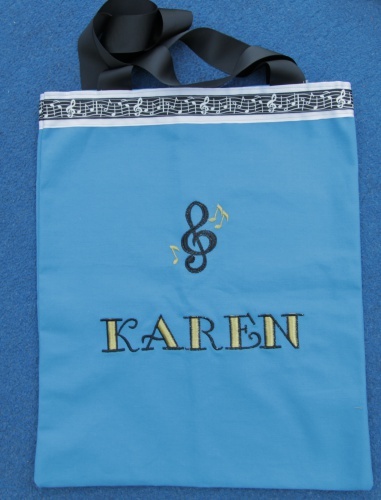 Embroidered Personalized Music Note Tote Bag just for you! This is the ultimate styled tote bag for you to organize yourself for music class. Keep all of your music books together in this bag and have it waiting by the piano for you. Reach in and grab your books to practice, then put them back in the bag so it is ready to grab and go out the door to your lesson. Organized and Personalized! Music Note and Name is done in two colors, you can pick the colors of your choice.